All five members of the Nearby Norwegians have been involved with Nearby History writing, research, and oral history seminars, held in Seattle at the Museum of History and Industry (MOHAI). The seminars are what inspired the name of our writing group, in fact. Each year, the autumn research seminar ends with an evening event when participants make short presentations about their projects. On January 14th, Chery Kinnick and Cathy Lykes were among the historians who presented to a group that included friends, family, history enthuasists, and interested members of the public. 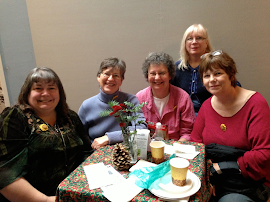 Pictured at Nearby History Presents on January 14, 2009 are (l to r): Dr. Lorraine McConaghy, Luci Baker Johnson, Chery Kinnick, Cathy Lykes, Barbara Sullivan, and Carolyn Merritt. Over the past 10 years, the program has grown and reached out to hundreds of local writers and researchers engaged in various types of projects. Dr. Lorraine McConaghy, Nearby History's program creator, facilitator, and instructor, has indicated that although not all of the writing projects deal with locations near to Seattle and the Pacific Northwest, they are all "near to the heart." Lorraine McConaghy plans to retire from her position as MOHAI's lead historian within a few years, in conjunction with the Museum's upcoming move to Lake Union Park in 2012. McConaghy is handing off the coordination and teaching with Nearby History to co-worker and writer, Helen Divjak, in the hope that it will continue to thrive and grow as a community outreach program. You can read an article by Helen Divjak detailing the background of Nearby History: "Nearby History Celebrates Ten Years." Beginning this year, in coordination with the centennial celebration of the Alaska Yukon Pacific Exposition in Seattle, Nearby History seminars will focus on a selected topic each year. It is a different model from past years when participants could chose their own topics. We look forward to seeing Nearby History continue to inspire writers and researchers for many years to come. The program has been largely responsible for our growth as writers and researchers, and we owe many thanks to Dr. McConaghy, our mentor and friend, and to MOHAI.